And such is the quandary for an actor who becomes larger than himself. Grant is the classic leading man, yet difficult to pin down. His comic timing is impeccable (see His Girl Friday), yet Hitchcock finds the man beyond the handsome face (see North by Northwest). A British-born actor who became an American citizen and had an accent that was a conglomeration of influences. His career in movies expanded over three decades and the American Film Institute named him the second greatest male star of the Golden Age of Hollywood, yet he never won an Academy award. Apparently, a lot of people found him exciting. He was married five times and with Dyan Cannon he had his only child, a daughter. He was 62 at the time and retired from filmmaking in 1966 to focus on his daughter. Maybe family was so important to him since he lost a number of relatives in the bombing of Bristol by the Nazis. Or maybe he did not want to be a fading star, choosing to leave films when he was still in demand. Either way, he left behind an incredible list of films. So, how did we choose which ones to show? I would like to say we poured over hours upon hours of films, consulted a number of leading film critics, and settled on the four essentials. But, actually, we wanted a Christmas movie, but not one we always see on television 24 hours a day (e.g. Christmas Story, It’s A Wonderful Life). 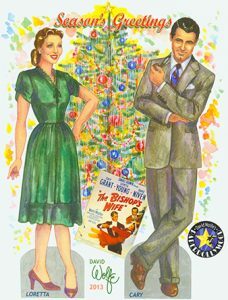 The Bishop’s Wife (1947) was suggested, and the Cary Grant series was created. The Bishop’s Wife paper doll set! Personally, I pushed for His Girl Friday (1940) and Bringing Up Baby (1938), two of my favorites. 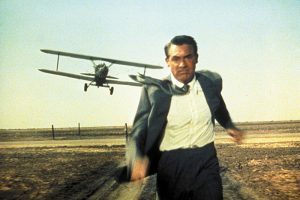 But then we wanted to fit in one of his Hitchcock films and settled on North by Northwest (1959). Then there is the star-filled The Philadelphia Story (1940) with Katherine Hepburn and James Stewart — hard to pass that up. So out went Bringing Up Baby (with Katherine Hepburn) and the lineup was set. Yes, we had to pass up on his first starring role in a film, with Mae West. Or the classic, Arsenic and Old Lace, which he hated and Houseboat with Sophia Loren, whom he loved, but, alas, was not loved back. No on Notorious and To Catch a Thief? Ouch. Still, we think you’ll agree we have four great films to see on the big screen (maybe once again, maybe for the first time — we won’t ask). Cary Grant and Rosalind Russell in “His Girl Friday”( and Russell in his office and then at the prison newsroom — I’m laughing as I write this). ( and Russell in his office and then at the prison newsroom — I’m laughing as I write this). (Grant and Russell in his office and then at the prison newsroom — I’m laughing as I write this). Tell us what we missed? What we did right? Other ideas for our One Night Only series? But most of all, come and see the films. It is how we know we are on the right track. Visit the Knickerbocker website for trailers and details. 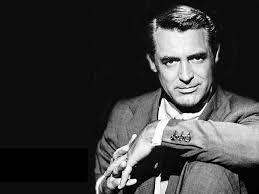 Donated his entire salary for Arsenic and Old Lace (1944) ($100,000) to the U.S. War Relief Fund. He never said “Judy, Judy, Judy” in the movies, which he credits to Larry Storch, but he did say “Susan, Susan, Susan” in Bringing Up Baby (1938). Turned down roles opposite Audrey Hepburn in both Roman Holiday (1953) and Sabrina (1954). He also turned down the role of James Bond, saying he was too old, although the part was partly created with him in mind. In His Girl Friday (1940), his character remarks, “Archie Leach said that,” a reference to his real name. He never played a villain. Always cited his To Catch a Thief (1955) co-star Grace Kelly as his favorite leading lady. He attended her state funeral in 1982 and wept throughout the televised service. In case you are checking, we also stole some of this information from the ultimate source, Wikipedia.